(Phys.org)—A trio of physicists has uploaded a paper to the preprint server arXiv describing the results of a survey passed out to attendees at a physics conference held in 2011: Quantum Physics and the Nature of Reality. The purpose of the survey was to find out how much agreement or disagreement there is in the physics community regarding the most fundamental ideas of quantum mechanics – surprisingly, the results showed that there is still very little consensus among physicists regarding some of its most basic principles. Quantum mechanics at its heart is the study of the building blocks of the universe – what they are and how they work together to form reality as we are able to interpret it. Its ideas were first developed almost a century ago with such notables as Albert Einstein and Niels Bohr developing theories and debating ideas such as whether particles exist at certain places at certain times, or whether they move around constantly with a probability of being someplace at a given moment. The second idea famously led Bohr to conclude that if that were the case than the universe is indeterminate and at its base probabilistic. Refusing to believe such a possibility could be true, Einstein responded with perhaps his most famous quote that "God does not play dice with the universe." Now, nearly a century later, modern physicists are still just as divided. In the survey, just 42 percent of respondents agreed with Bohrs' assertions – the rest were divided among several other theories. Also likely surprising to those outside the physics community, a full 64 percent of those who bothered to respond to the survey said they believe Einstein's view of the universe "is wrong." Another idea that appears to still vex the modern physicist is whether quantum objects have the same physical properties as they do when measured. Just over half thought so. Also there is the ongoing argument about the probability of a true quantum computer coming to pass, and if it ever does, when that might happen. The largest number, 42 percent said they believe it will happen 10 to 25 years from now, 30 percent said it would come after that, while just 9 percent said they thought it might happen before then. Based on the results of the survey, it appears Richard Feynman was right when he once responded to a reporter's question about how well quantum mechanics is understood by saying that "anyone who claims to understand quantum theory is either lying or crazy." Foundational investigations in quantum mechanics, both experimental and theoretical, gave birth to the field of quantum information science. Nevertheless, the foundations of quantum mechanics themselves remain hotly debated in the scientific community, and no consensus on essential questions has been reached. 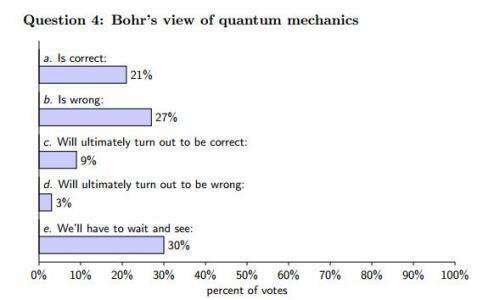 Here, we present the results of a poll carried out among 33 participants of a conference on the foundations of quantum mechanics. The participants completed a questionnaire containing 16 multiple-choice questions probing opinions on quantum-foundational issues. Participants included physicists, philosophers, and mathematicians. We describe our findings, identify commonly held views, and determine strong, medium, and weak correlations between the answers. Our study provides a unique snapshot of current views in the field of quantum foundations, as well as an analysis of the relationships between these views. When this sort of thing happens, it's time to adopt a constructivist philosophy and look outside of the domain for leads to seed those new lines of investigation. Also, theorists need to come to grips on the fact that the philosophical problem of unconceived alternatives is in tension with this (positivist) notion of demarcation: If you believe in demarcation, you are ignoring the problem of unconceived alternatives. The positivists appear to throw critical thinking out the window, out of a fear that people might think about "pseudoscience". The education reformers know better than this: That we cannot teach people to think like scientists by teaching them what scientists think. If we gain variance in belief as a byproduct of teaching critical thinking, then who cares? It's the critical thinking that we need, and all of this memorization-based assessment which goes on in the physics programs is undermining that. Concept mapping and force concept inventories are the future. The generic problem is that physicists throw up their hands, having an experiment program (Bell tests, decoherence, spacetime non-locality et cetera) but refuses to put down theories to peer review, hence "interpretations". The specific problem is that the religious Templeton foundation asked philosophers instead of merely theoretical physicists. @HA: Scientists are explicitly not "positivist" philosophers, which assume rationality (and perhaps observation) is sufficient. Scientists use testing et cetera. See above how this is neither polling "positivists" nor "physicists". It is polling those who can agree to attend religiously founded "science" conferences. "surprisingly, the results showed that there is still very little consensus among physicists regarding some of its most basic principles." That statement is 100% false. The author , Yirka, knows it is false. Quantum Physics is the most accurate and most well tested idea that humans have ever developed. The fact that some "philosophers" or mathematicians don't understand the basics does not indicate any problems with the physics. Why they would survey non-physicists about quantum physics, is what I was wondering about. Thanks to Couder and Unruh, we have water surface analogies of Hawking radiation, quantization of atom orbitals, Zeeman effect, double slit experiment and many other quantum phenomena. Only idiots couldn't realize from it, how the quantum mechanics is actually working on background of dense aether model. But the physicists aren't motivated into reconciliation of their theories too much - at the moment, when their understanding starts, their research and safe life will end, as Robert Wilson already noted before years. Is this means that God (nature) acts as a magician in creating the micro world? Of course not, it is not God's problem; instead it is our problem i.e. human ignorance! Understanding the mechanism behind quantum mechanics (as below) would settle the matter. That's because they are missing options, like f) A superposition of all of the above. The biggest CIRCUS in the world? Who has the biggest ring and the most clowns? CERN!! And the other theoretical physicists are just as funny. It´s nice to hear about such poll, but science should of course not become a democratic process a la politics. I wonder about the collegues who "votes" for "will ultimately turn out to be wrong". Have they proved some inconsistency experimentally or theoretically of the Bohr´s view? Unfortunately it has become just that at the 1927 Solvay Conference in Brussels! It is easy to do that: Bohr's model of the atom invoking an electron-"particle" orbiting a nucleus with different allowed orbital momenta, has a lowest energy-state when the momentum is zero. And in this state the electron must have merged with the nucleus. The Bohr atom is thus not possible. Schroedinger gave the correct solution which shows that the electrons around a nucleus form stationary waves, and that the lowest energy-state is a stationary wave that cannot exist within the nucleus. Bohr did not like this and came up with the insane "complementarity-principle". And physics became derailed! Schrodinger himself proved that Heisenberg's matrix approach was equivelent to his, and could not counter Born's probability interpretation of his 'waves'. The positivists appear to throw critical thinking out the window, out of a fear that people might think about "pseudoscience". [...] That we cannot teach people to think like scientists by teaching them what scientists think. [...] It's the critical thinking that we need, [...] Concept mapping and force concept inventories are the future. The non-intuitive nature of qm was forced upon physics. It was not the result of conspiracy. It was the result of the realization (positivists assertion) that we can not continue to get away with conforming (subatomic) Reality within concepts that are artifacts of thought, .... conceptual artifacts that depended upon the arbitrariness of how the mind evolved to operate on macroscopic experience. To assert 'particle' or 'wave' as existing independent of observation, as in Realism,.. is metaphysics. As Bohr pointed out, it was never up to Einstein to decide how reality 'should' behave,... and so physicists must get out of their own way. Ha ha, so true! And sad at the same time. But I guess the saddest clowns in the arena always get the biggest applause. From kids at least. If you have EVER done a course in physics, you will know that matrices and wave behavior are related. For example: The change in shape and size of a light-wave which passes through a lens can be elegantly modeled by using a matrix operator. This DOES NOT mean that the light wave is a "particle": Whatever the latter term means in your confused mind. I have asked you before: When any object passes you by, how do you know that it acts like a particle or acts like a wave? As soon as you answer this simple question I will attend again to the rest of your nonsensical babble. It is impossible to answer all the questions without being forced to choose between concepts which are ALL nonsensical physics. By giving a choice of answers which are all irrelevant does not help at all. IMO all interpretations of quantum mechanics have certain meaning, they're just less or more relevant to vanilla version of quantum mechanics, as defined with its six postulates. As a programmer you can handle the various interpretations of QM like SW libraries, which are all using some common underlying API. They're raising some aspects of quantum mechanics into account of another ones. For me the most insightful is the deBroglie/Bohm pilot wave interpretation with respect to the dense aether model, but I could live with whatever else other interpretation of QM. To commenters who deride the participants as non-physicists, here's the breakdown from the arxiv paper: "A total of 33 people turned in their completed questionnaires; of those, 27 stated their main academic affiliation as physics, 5 as philosophy, and 3 as mathematics" (multiple answers were allowed). Mr. Yirka or at least, his editor, should have been able to spot this story as pure garbage. I hate trolls like you! If you claim this study is garbage you should motivate why you think it is garbage; or else it is only your opinion that is garbage!